Bernardus Winery owner Ben Pon appreciates wine as an art and his wines reflect this aesthetic. Bernardus was the fifth winery to establish vineyards in the Carmel Valley and currently has 50 acres planted to Cabernet Sauvignon, Merlot, Cabernet Franc, Petit Verdot, and Sauvignon Blanc. Pon’s goal has been to make a red wine equal to the finest from Bordeaux and the winery’s resulting Marinus Estate Bordeaux-style red wine has met that goal and is the centerpiece of the winery’s production. Additionally, Chardonnay, Pinot Noir and Sauvignon Blanc are sourced from cool coastal vineyards for vineyard designate wines. 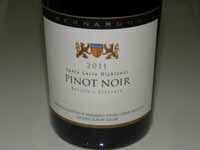 I have had only passing interest and experience with Bernardus Winery Pinot Noir in the past. 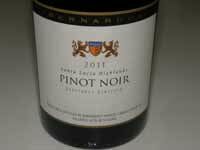 Recently, the winery sent me several 2011 Pinot Noirs to review and this was quite an eye-opening experience. Winemaker Dean De Korth has applied his training and apprenticeship in Burgundy to craft some extraordinary wines that are consistently stellar across the entire lineup. De Korth (pictured below) obtained a degree in Viticulture and Enology at the Lycee in Beaune and the University of Burgundy in Dijon. He worked for Jean-Marc Pavelot in Savigny-les-Beaune, Domaine des Comtes Lafon in Mersault, and Olivier Leflaive in Puligny Montrachet, before being offered the position of cellar master with Pierre Morey in Meursault. 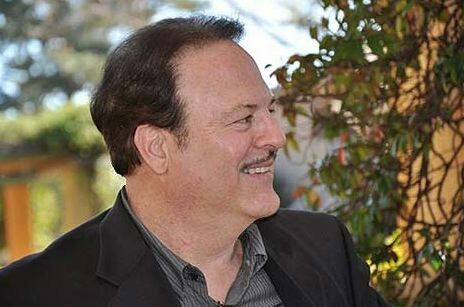 Upon returning to his native Monterey Bay area to be closer to his family, he worked as the winemaker for several prestigious Central Coast wineries including Morgan, Talbott and David Bruce. He is ideally qualified to apply Old World winemaking techniques in the New World setting at Bernardus. After hand-sorting, the Pinot Noir grapes are de-stemmed and gently pumped to small fermenters retaining as many whole berries as possible. Each fermenter is hand-punched or pumped-over twice daily until fermentation is complete. The solids are then pressed and the wine is aged in barrel 10 months before final blending and bottling. Vineyard sources are at the top end. The Bernardus tasting room is open daily at 5 West Carmel Valley Road in Carmel Valley. The wines are also available through the winery’s wine club and online on the website at www.bernardus.com (the 2011 vintage wines are net available at the online store offering at the time of this publication).